Hand-painted and carved wood earrings in a variety of shapes and sizes. One, two and three layer earrings, each one more detailed and elaborate than the next. 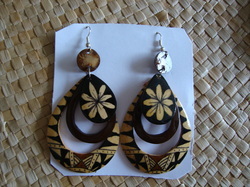 Earrings hand-made in Samoa from coconut, mother of pearl, and tapa. Hand-painted designs. Made in Samoa. Mother of pearl earrings carved with island designs. Mother of pearl and shell necklaces and bracelets. Made in Tahiti. Long, dangle earrings, carved from coconut shells, with woven, and painted accents. Made in Samoa.